Today, more than ever, with the increasing volatility of the coffee market and our growing understanding of the challenges faced by our partners at origin, we must seek the next level of mutually beneficial commercial relationships as we buy our green coffee. Too often, because of limited understanding of how we can more positively contribute at origin, our sourcing behaviors result in the need for corporately driven charities and organizations. These efforts are designed to help address the hardships we know of in coffee producing communities at the beginning of our supply chain. 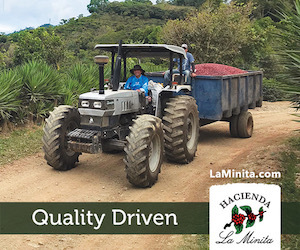 More than 20 years of experience in our industry working to understand a wide range of stakeholders — from farm to boardroom — leads me to believe this stems from relatively little understanding of the true economics of coffee production. And, because that information is difficult to ascertain and study through validated and trusted means, it is easier and more practical for coffee companies to create and support charities, programs, and projects than it is to understand the economics of their raw material. 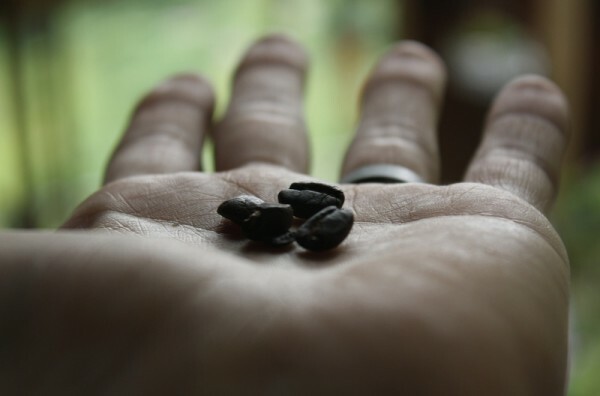 Even though we may be beginning to understand the unsustainability of supporting a cycle of poverty and charity dependence in our value chain, we lack critical information today, making it seem impossible to pay a price based on production economics that would ensure an ongoing supply of green coffee and support the livelihoods at the start of our supply chain. Simply put, we want the businesses that support the livelihoods of the people who produce coffee to thrive. Yet most coffee companies themselves are neither prepared nor responsive enough to efficiently accommodate revised costs for raw materials without causing irreparable damage to themselves, or even jeopardizing the livelihoods they hope to support. This creates the impression that many coffee companies are unable or unwilling to understand the true economics of the production of the raw material they require. And without accurate information on which to base important business-guiding decisions, the industry’s purchasing behaviors have struggled to evolve. So, what do we do? We need to pursue two simultaneous strategies. Coffee companies are not willfully blind to the economic challenges in the value chain, they simply lack information that could expand the value assigned to the raw material within their business models. Strategy one is to prioritize the gathering of information about coffee production economics. Second, we must confront what is our nascent understanding of different market tools that exist to provide opportunity for more economic benefit. When market tools are considered an “insurance policy,” to help limit volatility and potentially access improved economics for our entire value chain, we can begin to see their potential. Both concepts are intimidating propositions for how they will change our businesses, but increased volatility of the market and the economic hardship often faced by our origin partners merit a pragmatic response that will lead to new behaviors deeper thinking in our industry. Information circulates about what the cost of production is in various origins today, but there is little trust surrounding those figures. As an industry — and particularly as a specialty industry whose existence depends on a differentiated, high-quality product — it behooves us to improve our understanding of what it will take to maintain future supply. We need a meaningful and validated study of the economics of coffee production coming from various key origins and, further, the regions within those origins. As our collective understanding of these economic equations broadens, we can begin to examine how we may need to evolve our business models. 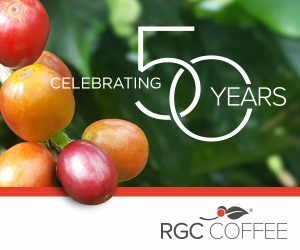 A critical part of that work will be to increase consumer perception of the value of coffee to ensure customers support necessary changes in our value chain — i.e., potentially having to pay higher retail prices — by continuing to celebrate quality and building understanding of what it should cost. As we do this, we need to continuously remind ourselves that the information we are seeking should be used to evolve our businesses in order to maintain access to the raw material we depend on. 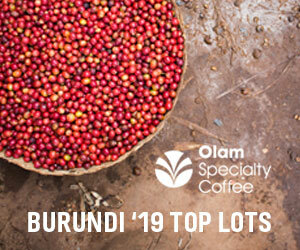 Without addressing the fundamental economic challenges on the supply side of our value chain, we will have to sit by and watch as more and more farmers from upcoming generations flee coffee production in search of more lucrative opportunities, thereby further jeopardizing our access to supply. 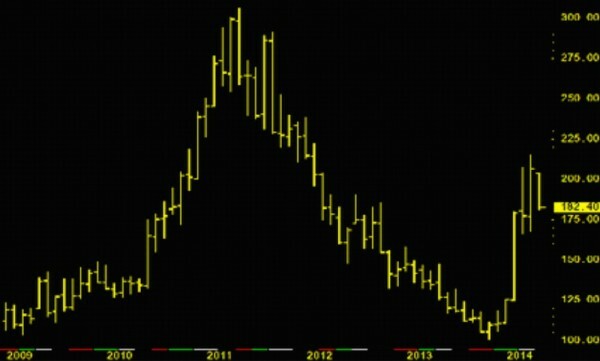 The chart below illustrates the slow increase in the value of green coffee traded over the past generation. 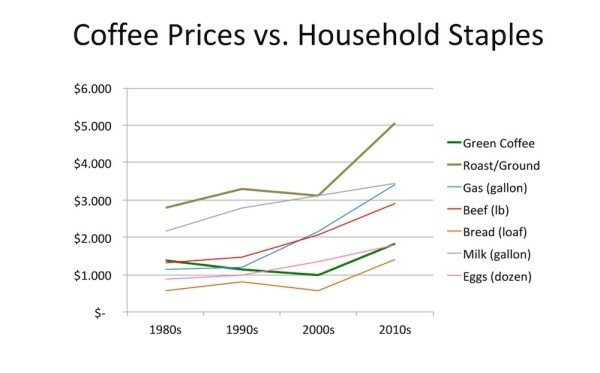 Due to averaging prices over entire decades, the pricing for green coffee appears much smoother than it felt in reality, but the important fact here is that over the course of the past 35 years, the costs of basic household goods — using U.S. prices — have increased much more steadily than the value of green coffee, indicating increased hardship for livelihoods supported solely by coffee farming. 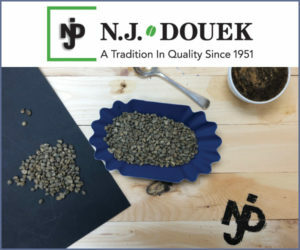 It is important to note that the average price for roasted and ground coffee has exponentially increased beyond that of green coffee. While the coffee industry must encourage and support the study of this critical information for our value chain — it is presently being discussed within the Specialty Coffee Association of America and its Sustainability Council — those on the consuming or roasting end of the value chain must begin to ask suppliers and partners for this critical economic information. We need to collectively demonstrate an appetite for the facts and a willingness to evolve. It is important to remember that the answer to the challenges we face in our value chain is not as simple as just paying prices that take into account the cost of production in an educated way. We have nearly an entire generation’s worth of damage to undo related to how coffee has been commercialized, so we should use what tools we can to create more economic resilience to make up for lost time. When averaged out to smooth volatility, coffee off the farm trades at levels roughly around those of the 1970s. How much more is a bag of fertilizer? A gallon of gas? An education? A house? Considering this, how can we blame our partners at origin when they default on contracts in favor of higher prices when the market will bear them? The pent up demand has led, in some cases, to poor decisions that can seem to convey a lack of producer loyalty. But those of us on the consumer side need to remember that conditions have been desperate for producers. Debts are high. And, in most cases, we have a disaggregated smallholder population that lacks the financial resources to manage. The result is a need for widespread strengthening of financial literacy for so many of our farmer partners. To ensure longevity, we need to educate our entire value chain on how to use the commodities market and the tools it offers in ways that extend options for producers to hop back into the market when higher prices on the exchange arise within the timeframes defined in their contracts — even if that means contracts are structured in a way that says the roaster will pay for these tools. Conversely, roasters can use instruments that will allow them to enjoy a similar benefit from downward trends in the exchange price. By educating our industry on how to use the tools the market can offer as “insurance,” and then encouraging their adoption in future contracts, we can better safeguard the interests of both parties. Many of the market tools we can apply will expire before they reach a value at which the volatility they protect against does not occur, but investing in an “insurance policy,” can greatly reduce the risk that producers will default when the market rallies. Again, think about the economic situation for most producers and try to empathize with the tendency. 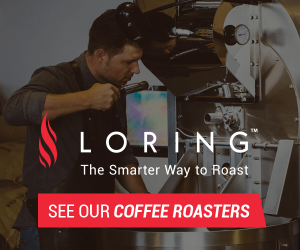 Similar tools provide a type of insurance that can allow coffee roasters to ride the market to lower levels in a downward trend to capitalize on lower fixations without compromising the price they pay their suppliers. It’s complicated, but these tools are important for us to understand. When this market jargon is articulated in ways that illuminate paths to navigate today’s market volatility, and sometimes even be used for gains across the value chain, it should be compelling. As a specialty coffee industry, we’ve worked for more than 30 years toward the appreciation and connoisseurship of this product, yet we’ve only just started to understand how to evolve the system of commercialization to ensure that prized coffees will exist in the future. Certification schemes that introduce environmental and social criteria and monitor trade and minimum pricing structures have taken hold in a meaningful way and are having a positive impact, but there is much more we can do to improve the economic resilience of our entire value chain by using the tools the market has to offer. The generation of farmers now approaching retirement age rode what has generally been a downward slide in coffee’s value — certainly in relation to their cost of living. And many, if not most, recall the earning potential that once existed in coffee. Their kids, however, who should be starting to take over farm management, too often can’t be persuaded to stay in the line of work they have watched their parents struggle through for most their lives. In some cases, growing up in the midst of coffee farming has limited their opportunities. This is especially true in countries where economies are developing and other income-earning options are emerging. 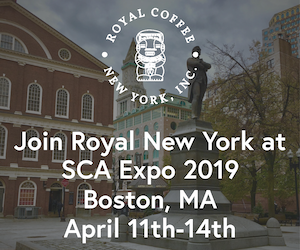 Ric Rhinehart, executive director of the Specialty Coffee Association of America, reminds us often that we need to seek opportunities for our supply partners to thrive, not just survive, if we are going to have a hope of maintaining access to a differentiated supply for our industry. In Costa Rica, where it has been hard for years to attract laborers for coffee, and where alternative opportunities exist as their economy develops, coffee is on a fast track to becoming a wealthy farmer’s hobby, provided said farmers find a market for the surely high-priced produce they will have after others have gone — that is if housing developments don’t replace all of the coffee in the country first. In Colombia, where the average age of a coffee farmer is approaching 60, the Federación Nacional de Cafeteros has tried with little success to woo younger farmers into coffee. Again, how can we blame this next generation when we know the challenges they have faced already in their lifetimes? 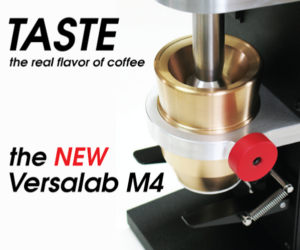 An enormous challenge lies ahead for us in the coffee industry. A large part of it involves learning and absorbing new information to ensure our future viability. The most difficult part is going to be to accommodate the need for change, and then acting with meaningful and revolutionary actions that safeguard a more comprehensive and shared value chain. Since we are an industry that is so connected to our product and its storied supply lines, I am certain we will find our way forward. Ban speculator parasites from the commodities market. Having viewed this first hand starting back in 2006, and to some degree even earlier, it almost parallels what we have seen right here in our own backyard where farmers are concerned. While the U.S. produces very little coffee compared to Central and South America, the plight of the farmer seems pretty much the same around the world. The most traded consumable commodity in the world, where the producers, the great majority, derive little to no benefit from the fruit of their labor. 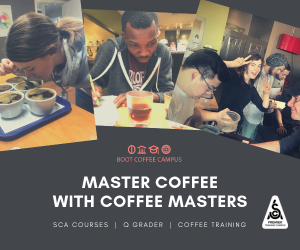 There has been much talk by the various coffee organizations such as SCAA, that directly benefit and have had knowledge of the problem for decades. 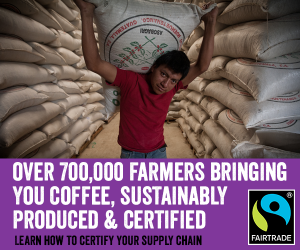 Yet it has taken organizations like Sustainable Harvest and Cooperative Coffees to step up to the plate. 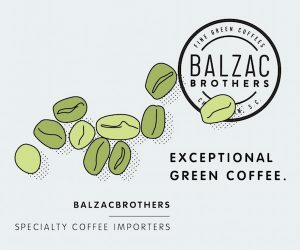 It is encouraging to see importers like Cafe Imports actually starting to work with producers, but the real change needs to be modified to this simplest form of direct to producer/roaster. Just my thoughts, as I make no claim to being an expert or more than a very conscious observer. Thanks Chad for your thoughtful and proactive piece…. and agree wholeheartedly with your conclusions. We, as an industry, must get better at understanding the true costs of production and at promoting terms of trade that makes coffee production a viable endeavour for farmers. At CoopCoffees we have built our relationships with a concern for farmers well-being at heart. But we often find ourselves bumping up against “market realities” – to the detriment of our roaster/members ability to compete on the shelf. We must promote fair pricing for high quality coffee on an industry-wide basis! The first challenge is for traders and roasters to see and treat farmers as our equals, and to recognize our mutual dependence on each others’ ability to succeed and thrive in our respective businesses of growing, importing and roasting coffee. 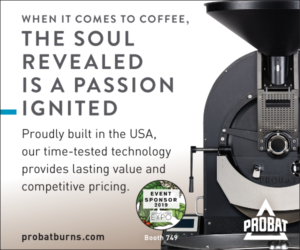 Looking forward to seeing this dialog continue throughout the ranks of the SCAA! As much as it is important for coffee companies to understand the economics of coffee, I believe real industry wide change will not occur till the consumer understands the impacts of their coffee purchase. 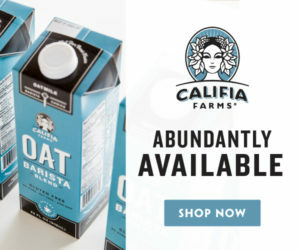 (Admitedly – easier said than done) That being said, if consumers are demanding fair treatment and wages for farmers, coffee companies will gladly comply to give the market what it is looking for in order to gain market share. 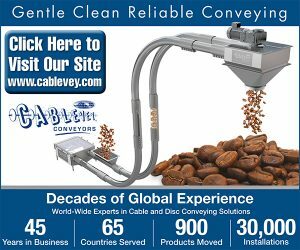 Certifications have helped with this to a small extent, but the average consumer still knows little to nothing about them. Rather I believe to accomplish this awareness the consumer needs to be provided as much interaction with the farmer as possible. At Mission Arabica (a for profit social enterprise dedicated to enabiling third-world villages in South East asia produce and sell specialty grade coffee to improve their quality of life) we believe the closer the consumer gets to the farmer the better off the farmer will be. Additionally, the consumer will have a greater appreciation for their coffee because they know where it came from and the farmer that grew it. 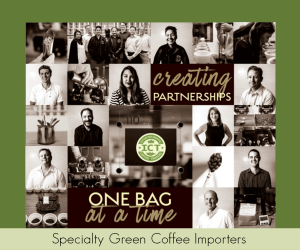 We are not the first to promote the consumer – farmer connection, but I do believe it is the first step of many the coffee industry needs to fully embrace in order to ensure the future success of all parties in the supply chain. Perhaps the greater question is what product can we use as an example, of what all this effort can be directed toward? Where has consumer awareness become so accepting of a consumable product, that has such a dependancy on international human labor, that would excite the willingness to pay a “fair” price that justly compensates the producer? The greater issue here may not be the consumer, rather the producer. Retail prices could be raised, which does not mean the producer necessarily benefits, rather those between the two. Just as farmers in this country are dependant on others to get their products to a retail market, there are going to be exporters/importers, roasters and others that all have to profit along the way. History shows that the producer only recently has become aware of the disparity their coffee is purchased for compared to what the consumer pays. World prices only seem to be influenced when something affects the coffee harvest in Brazil. So is this where it has to start? As a consumer/afficinado this is more than just interesting for me. I am really glad that this bit of thought is generating these comments. 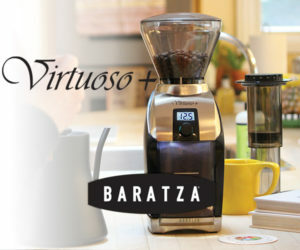 My opinion is that we, in coffee, have a unique and innovative opportunity to really leverage the ritual and the connection that consumers have with our product unlike with most others out in the marketplace to try and tell this tale of what it takes to produce it and what it will take to keep folks producing it. Coffee presents for us a stage from which we can broadcast not only the stories about its production and the lives it touched, but also work toward the continuation of elevating the consumption of it along with a heightened awareness about the traditionally exploitive practices that too often have left the producer in the dark where financial opportunity is concerned so that we can expand our consideration in our behaviors. Historically, coffee has not been set aside by consumers when they have been asked to pay more for it because it is a part of our daily routines and existence–it gets us going, it is social, it is nostalgic… that connection is what we need to continue to tap into in order to preserve a supply chain so that we can continue to celebrate and enjoy this special product. Meanwhile, we have so much learning to do about the key themes of the piece: economics of coffee production and the market tools we can use to bolster financial resilience for our value chain. I would offer that unless we base our forward moves on these two areas of concern, we will be missing important opportunities for the future in coffee. The market is not going anywhere and no matter how coffee is commercialized today (direct trade, etc) it it likely to have been hedged against it at some point…we may as well learn as much as we can about it and use it to our advantage. I think it’s important to look for other examples where producers or wage workers are benefiting. And one still has to remain price competitive. How many delegates at SCAA were wearing a cotton shirt. Were they really concerned about the smallholder cotton farmers plight, or the wages of the cotton pickers, or the conditions in a Bangladesh sweat shop where the shirt was made? I don’t think it has much influence on buying behavior. We may recall that some years back Nike went through negative publicity. So, maybe they did respond by improving on worker welfare. How about all the goods we buy that are made in China – do we really dig into equity issues in the supply chain. We probably only consider sticker price and some visual perception of quality (value for money). Good comments from Coopedota you sure know what´s going on in this side of the coffee industry, producers side. We need a rentable activity to continue generation to generation but with stability and sostenibility.